This section is no longer being updated. Access the permanent replacement section at http://proximityone.com/cbsa/1/cbsa31340.htm. Please bookmark this new URL. Access 2018 S&O Reports, featuring county and metro projections to 2030, via the interactive table at http://proximityone.com/metros.htm. The 2018 reports are similar but have been greatly expanded and updated. Summary of recent business, demographic, economic trends; year-ahead & 5-year outlook. - the Recent Trends & Outlook section, updated quarterly, covers topics about this metro such as .. assessing the implications of next jobs report .. impact of Fed''s interest rate action .. which sectors are expanding or contracting .. housing market conditions .. insights to help your planning and decision-making. The Recent Trends & Outlook section is available in the subscription edition. The total population of the Lynchburg, VA MSA metro changed from 253,054 in 2010 to 258,151 in 2015, a change of 6,896 (2.7%). Among all 917 metros, this metro was ranked number 180 in 2010 and 185 in 2015, based on total population. Annual net migration was 730 (2011), 1,151 (2012), 977 (2013), 907 (2014), 907 (2015). View annual population estimates and components of change table. See more about population characteristics below. This metro is projected to have a total population in 2020 of 267,932. The projected population change from 2010 to 2020 is 14,908 (5.9%). The population ages 65 years and over is projected to change from 40,944 (2010) to 57,425 (2020), a change of 16,481 (40.3%). See more about population projections. Based on per capita personal income (PCPI), this metro was ranked number 442 in 2008 and 536 in 2014. among the 917 metros for which personal income was estimated.The PCPI changed from $32,912 in 2008 to $36,237 in 2014, a change of $3,325 (10.1%). Per capita personal income (PCPI) is a comprehensive measure of individual economic well-being. Use the interactive table to compare PCPI in this metro to other metros. See more about PCPI in Economic Characteristics section below. 282 metropolitan statistical areas, of the total 381, experienced an increase in real Gross Domestic Product (GDP) between 2009 and 2014. This metro ranked number 209 among the 381 metros based on 2014 GDP. The GDP (millions of current dollars) changed from $8,441 in 2009 to $8,944 in 2014 a change of $503 (5.96%). Real GDP (millions of real, inflation adjusted, dollars) changed from $8,441 in 2009 to $8,233 in 2014, a change of ($208) (-2.46%). GDP is the most comprehensive measure of metro economic activity. GDP is the sum of the GDP originating in all industries in the metro. See more about GDP in Economic Characteristics section below. Attributes of driil-down, small area geography within the metro ... metros account for 65,744 of the national scope 73,056 census tracts (others are in non-metro areas). This metro is comprised of 60 tracts covering the metro wall-to-wall. View, rank, compare demographic-economic attributes of these tracts using the interactive tables. Use the CBSA code 31340; see table usage details below the table. Lay of the Land. The following map shows the metro with bold boundary. Updated monthly, quarterly, annually. Housing market conditions and extended detail Available in subscription edition. All places time series population estimates interactive table. Updated periodically, annually. General demographics, social characteristics and extended detail Available in subscription edition. Metropolitan areas are defined as one or more contiguous counties based on a set of demographic-economic criteria. Counties comprising the metro are shown below. For multi-county metros, this section provides insights into how the population is changing by county. Many metros changed geographic composition (counties included in the metro) between the Census 2010 vintage and the current vintage. These changes, if any, are also shown below (county is marked with **). 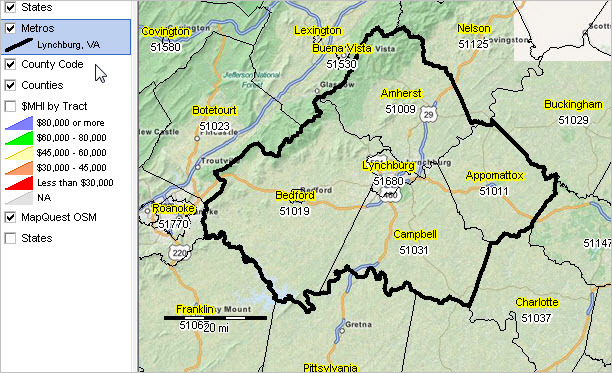 See projections in related section.Click county code link to view county components of change. All counties population estimates & components of change time series interactive table. Updated quarterly. For more information, see RDEMS Main. Links open HSG1 Housing & New Residential Construction section. Select other sections from list above table. Updated annually. For more information, detail & to compare areas use interactive table. Updated Annually. Independent annual model-based estimates. For more information, detail & to compare areas use interactive table. Updated Monthly. 12 most recent months. For more information, detail & to compare areas use interactive table. Updated quarterly. All transactions; not seasonally adjusted. See related Housing Price Index (HPI) interactive table. See related 5-Digit ZIP Code HPI interactive table. The Economic Profile shows shows derivation and key components of total personal income. Data are organized by place of residence and place of work. The place of residence profile includes estimates of total personal income, population, and per capita personal income. The place of work profile includes estimates of total earnings, total employment and average earnings per job. Updated annually. See related interactive table. Dollar items are in current dollars (not adjusted for inflation). Per capita items in dollars; other dollar items in thousands of dollars. Updated periodically. Available in subscription edition. Updated monthly. Available in subscription edition. Updated quarterly, annually. For more information, detail & to compare areas use interactive table. Additional detail in subscription edition. Updated quarterly. For more information, detail & to compare areas use interactive table. Notes: cell value of '...' indicates value suppressed to maintain confidentiality. Use the following links to access detailed establishment and employment data by type of business (CSV files). .. see notes on using these files. For more information, detail & to compare areas use interactive table. Table shows 13 most recent months. Districts in this metro. Updated periodically. See related School District interactive table. All school districts enrollment & adminstratively reported data interactive table. 2014-15 School Year. Extended detail Available in subscription edition. Updated periodically. Voting patterns, citizen voting age population, state legislative districts, congressional districts .. in this metro.  All data are for current vintage county and metro definition. The subscription edition updates frequently. Selected items are listed below. Register to receive update notifications.  Overview lead narrative; quarterly & annual/March.  Housing Price Index (section 5.4) quarterly.  Establishments, employment & earnings (section 6.6) quarterly.  Economic profile and personal income (section 6.1) annual/November.  Labor market situation (section 6.7) monthly.  Residential construction; units authorized & value (section 5.3.) monthly.  Population by county; annual series 2010-2016 (section 4.2.) annual/July.  Population by county; links for individual counties (section 4.2.) annual/July. -- includes annual data 2010-2016. -- includes components of change; race/origin; single year of age; age group summaries.  Total population and components of change; annual/March.  Gross Domestic Product section; annual/September. Situation & Outlook Reports are a proprietary resource developed by ProximityOne. There is no warranty of any type associated with any aspect of this report. The user of this document is solely responsible to any use, direct or indirect, that might be made of this document.  Current estimates and projections: states to 2030, counties & metros to 2020 by age, counties & states to 2060. The Situation & Outlook Report, a component of the Situation & Outlook, is a core ProximityOne information resource providing insights into characteristics and trends of counties, metropolitan areas, states and the U.S. The Report also provides a gateway to drill-down demographic, economic and business data for smaller geographic areas. Metropolitan areas include approximately 94 percent of the U.S. population -- 85 percent in metropolitan statistical areas (MSAs) and 9 percent in micropolitan statistical areas (MISAs). Metropolitan Areas are designated by OMB ("Standards for Delineating Metropolitan and Micropolitan Statistical Areas") based mainly on Census Bureau-sourced data. Metropolitan areas are defined as Metropolitan Statistical Areas (MSA) and Micropolitan Statistical Areas (MISA). MSAs and MISAs are also referred to a Core-Based Statistical Areas (CBSAs). Contiguous CBSAs are defined as Combined Statistical Areas (CSA). By definition, metropolitan areas are comprised of one or more contiguous counties. Metropolitan areas are not single cities and typically include many cities. Metropolitan areas are comprised of urban and rural areas and often have large expanses of rural territory. A business and demographic-economic synergy exists within each metro; metros often interact with adjacent metros. The demographic-economic make-up of metros vary widely and change often. See more about metros. Principal Cities. The largest city in each metropolitan or micropolitan statistical area is designated a "principal city." Principal cities are designated by OMB based on Census-sourced data. Additional cities qualify as principal cities if specified requirements are met concerning population size and employment. The title of each metropolitan or micropolitan statistical area consists of the names of up to three of its principal cities and the name of each state into which the metropolitan or micropolitan statistical area extends. Titles of metropolitan divisions also typically are based on principal city names but in certain cases consist of county names. and in which the number of workers working in the place meets or exceeds the number of workers living in the place.